It seems that the latest tax data available from the IRS is from 2005 (Hmm, how long does it take them to tabulate this data, shouldn't they have 2006 done by now, if not 2007 as well...) You can slice and dice the data a number of ways, and hone in on just one set of taxes (e.g. 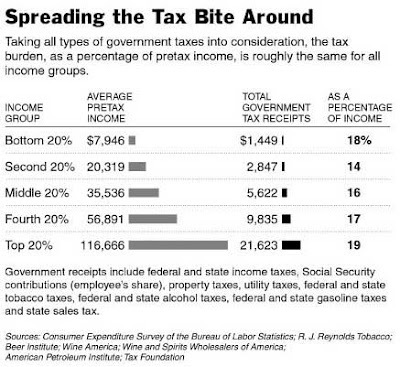 just the federal income tax) or look at the overall tax burden (i.e federal, state, local, excise, social security, etc.) on various folks. However, please keep in mind the 'tyranny' of large numbers... What does this blogger mean by this? 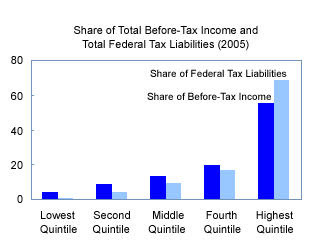 Well, at the federal level, filers (any one or family) with an adjusted gross income of over $145,283 fall in to the top 5% of tax payers. In other words the Obamas, the McCains, the Buffets, and the Gates are all in the same group. 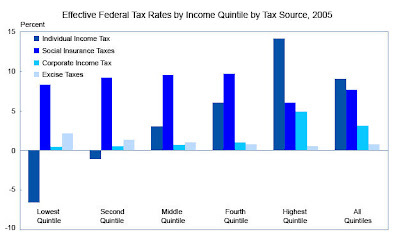 However the distribution of income within this (overall) small section is astounding - as well as the Obamas do, the McCains do vastly better; and yet compared to Warren Buffets and Bill and Melinda Gates both the Obamas and McCains live in relative poverty! So, when folks say 'you're in the top 5% you should and can pay more' it's true for some but not necessarily so cut and dried for others! Update: Actually, with an annual salary of approximately $169,000 every single member of the House of Representatives is also in the "top 5%," as well as all Senators (most of whom are significantly better off financially...). However, it is likely that they would all protest loudly at being considered alongside the Gates, Buffets, and Ellisons of the world!